On this episode of The Practice Marketing Podcast, hosts Garrett Smith and Don Lee discuss how you can get your practice started with internet marketing. Starting with the why behind internet marketing, Garrett and Don discuss the advantages and benefits of internet marketing, alongside how you can take the first steps for your practice if you haven’t done so already. For more information about this episode, and the complete show notes, please continue reading below. Segment #1 – Why Internet Marketing? If you’re not actively marketing your practice online, you are losing out on potential new patients, even if word of mouth and referrals are your main source of patients today. Effective online practice marketing allows more patients to discover your practice in a cost effective, trackable manner, that can scale-up as your practice grows. If you’re ready to get started with marketing your practice online, it’s important to establish goals, a point person who will own the effort, then create a focused plan that will guide your successful execution. Garrett Smith: 00:00 Hey everyone, Garret here. For more information about getting started with internet marketing, check out chapter one in Book Now! 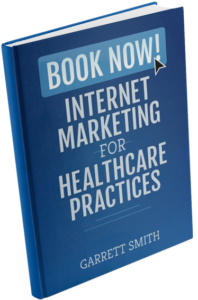 Internet Marketing for Healthcare Practices available at Healthcaremarketingbook.com. Garrett Smith: 00:12 Hey Garret, I recently read that over 80% of U.S. adults head online to research health information, but every time I head online half the practices I look for have little presence. Why is that? Garrett Smith: 00:23 On this episode of The Practice Marketing Podcast you will learn why you should be actively marketing your practice online, the advantages and benefits of marketing your practice online, and how you can get started marketing your practice online if you are not already. Announcer: 00:39 Are you looking to take your practice to the next level? Well, you’re in the right place. 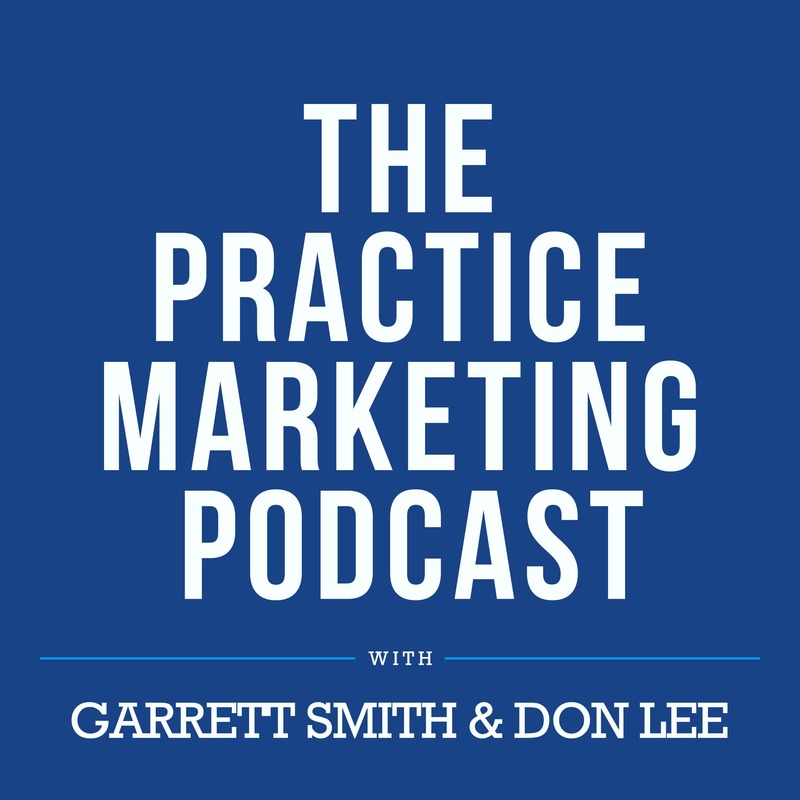 Welcome to the Practice Marketing Podcast with your host Garrett Smith and Don Lee. Garrett Smith: 00:52 Hey, everybody Garret Smith here. Practice Marketing Podcast episode number one: Getting Started with Internet Marketing. I’m really excited to be here with you today, talk a little more about, uh, how you and your practice can get started with internet marketing if you haven’t already. And, uh, some of the advantages and benefits, uh, for those of you who are maybe a little bit, uh, skeptical of getting started. I wanna take a moment here before we get started to introduce my colleague and co-host Don Lee. Don, uh, great to have you here. Looking forward to, uh, working with you, uh, on this project. Don Lee: 01:25 Yeah, Garret, thanks man. It’s really, it’s great to be here. I’m super excited to kick this thing off today a- and get, get things going and, and share the news with the folks, uh, who tune in to listen. Garrett Smith: 01:33 Absolutely. You wanna give the folks at home a little bit of a brief background about, uh, your experience in the healthcare space and what you, uh, do in a day in and day out basis? Don Lee: 01:43 Yeah, I’d be happy to. So I am a health IT consultant. I’m the President of Glide Health IT based out of Buffalo, New York. And really it’s, uh, the simplest way to put it is, uh, a lot of product development and business development. I help companies launch new health IT products and services. I’m now the host of the #HCBiz show. Uh, it’s a podcast dedicated to unraveling the business of healthcare and helping people to align their messaging with the business realities that they’re, they’re trying to break into today. Garrett Smith: 02:35 Excellent, and so on the other end of that, I’m gonna be playing, ironically enough, the role of practice marketer and, uh, educating everyone on why they should be practicing, uh, great marketing on the internet, in addition to talking about and exploring all the different strategies and tactics that you can use to be successful. Garrett Smith: 02:54 Uh, now part of the reason I’m even playing this role because, uh, for the last seven or eight years here, I’ve been helping private practices across the U.S., uh, with their online marketing. We’ve, uh, been very successful. We’ve developed, uh, lots of different methodologies, tactics, and strategies and so, uh … across a number of different specialties. We’ve really figured out what works, what doesn’t. I’m really excited to be packaging all of this into short 20 minute episodes that are actionable enough that after listening, you can hop on the internet and implement a lot of the things that we’re talking about. Garrett Smith: 03:27 So without further ado, let’s get started with episode one. And I know Don, there’s a question you’ve been meaning to ask me here and, uh, I think it’s a great one to start off episode one. Garrett Smith: 04:09 Yeah, Don, I think there’s really three big reasons that you should be marketing your practice online. And the first one that I start with really is that the majority of patients are already heading online first to find out information about their personal health and the health of, uh, perhaps people … their children or, or their parents. And so online has really, uh, become the first touchpoint. So we all know that, uh, there’s never … you don’t get a second chance to leave a great first impression and with so many patients going online first, it’s imperative that practices are present, and, uh, look as great o- online as they do, uh, offline. Garrett Smith: 04:46 You know, second, the scenario that, that comes up very often is, you know, the idea of getting a referral to a practice. You know, m- most practices today, their lifeblood, uh, is word of mouth and, a- a- and referrals from friends and family, but the internet really has kind of stepped in and changed that. Uh, even if you get, uh, a handful of referrals from friends and family for practices or particular provider, you’re still going to go to a search engine or perhaps even social media to do fact-finding and, and fact-checking. And the practice that has the best online presence, the, the website that’s easiest to use, is typically going to get the first call or, or the only call to come in and schedule an appointment. Garrett Smith: 05:27 And so, with that, you know as I said, patient referrals and word of mouth continues to be a, a large swath of how patients find out about a particular practice or provider, but really online reviews a- and social media have really kind of stepped in and, and become the new word of mouth, so to speak. A lot of patients head to social media and ask for different experiences. There’s dozens of websites that rate, uh, practices and particular providers that are heavily trafficked by patients. And so when you look at, you know, I, I guess why should you be concerned or why should you even be marketing on the internet at all … It’s because patients are going there and they’re relying on the internet, uh, to make their purchase decisions and over time they’re going to be doing that even more. Garrett Smith: 06:10 So, you know, if you’re not actively marketing your practice online, you’re missing out on a lot of the benefits that we’ll talk about in a second here. But also, too, you’re leaving out opportunities, I feel, for other practices who maybe don’t practice great medicine but have figured that, uh, if they practice great marketing, they can have a really, really nice business. Don Lee: 06:29 That’s all good. And again, as a practitioner, I’m kind of gonna straddle it a little bit as a pre-believer in marketing practitioner and then where I made this transition and how I jumped over. So, you know, that was it. Like, I did good work and I felt that, you know, and this is when I’m building software systems and rolling out solutions and architecting all that is … I do good work and that should speak for itself, and th- that should basically … that should do the selling for me. And I didn’t want to go out and basically do the dog and pony show, if you will, to convince people that I was going to do good work for them. I wanted to show them. Don Lee: 07:06 And what I found over the years was that I was regularly losing work to companies that I knew weren’t going to deliver. Like, I knew it wasn’t going to work out. I knew exactly how it was going to transpire and then I’d have this conversation with a, you know, a prospect 18 months later and they tell me how all the things that I told them were going to happen happened, and now they’re ready to work with me. But I didn’t help them from preventing themselves from going down that path in the first place. Don Lee: 07:31 And it wasn’t until I figured that out, it wasn’t until I started looking at marketing as a service that I was providing, as yet another way to create value for somebody … I wasn’t just trying to convince them into doing work with me or I wasn’t just … Sometimes you would almost think like, “Oh, I don’t wanna be tricky. I don’t wanna be gimmick-y, I don’t wanna do all that stuff.” But what if that’s what your customer wants? And what you just said to me speaks to that because the customer is going online. Your patients are going online to find this information. They want to find it there and if you don’t put it there for them, you’re not giving them what they want and if you don’t give them what they want, then you’re not gonna get the opportunity to give them what they need. Garrett Smith: 08:13 And really, that’s why I always tell everyone that I work with that, you know, success today isn’t as much about practicing great medicine by itself. You used to be able to just be a great provider and the, the business would take care of itself but, but today you really do need to both practice great medicine and practice great marketing and, uh, and so again, if you’re not, I think, you know, you’re doing the patient population in your area a bit of a disservice, right? Because if you make it difficult for them to discover you, they’re gonna maybe discover somebody else who isn’t as good as you. Announcer: 08:49 Pro-tip number one: if you’re not actively marketing your practice online, you’re losing out on potential new patients, even if word of mouth and referrals are your main source of patients today. Don Lee: 09:02 Okay, Garrett. So let’s say that first bullet point there convinced me that this is a path worth going down and okay, now maybe I do buy in. Maybe I do see marketing has potential to be a value in and of itself to my customers, both perspective and, uh, as we’ll see to existing customers too. What is it about internet marketing specifically that makes it different from traditional forms of marketing? Garrett Smith: 09:26 So when I look at what’s the main difference is really this concept of push versus pull. Traditional marketing and, let’s call traditional marketing: print ads, radio, television. Really, it’s all about pushing out messages from your brand to a captive audience. Garrett Smith: 09:44 On the internet things look a l- little different. The audience isn’t so captive. In fact, the audience often finds you. They find you by doing a search. They find you through social media. They find you in an article they read. And thus, the internet really sets you up to market your practice in a more tasteful manner, in a manner that I think aligns a little bit better with medical practices. Garrett Smith: 10:09 For example, a lot of people that we work with don’t wanna necessarily want to be on a billboard. They don’t want their face in their marketing. They don’t wanna be a pitch person. And so, doing traditional types of marketing really kind of either scares them or turns them off. You know, on the internet you can function much more as a subject matter expert. You can document your expertise on your website via content. You can hire agencies or consultants to work with you to publish, you know, great social media. Uh, you can do lots of different guests editorial. Um, you can really become more of an educator rather than a advertiser, okay? And so I, I really think first and foremost, the, the biggest difference is just, with internet marketing we’re trying to pull these patients into you versus, you know, push your messages out through, through specific channels or, as I like to say, beat people over the head with the same message over and over again. Garrett Smith: 11:05 You know, the second thing that really differentiates internet marketing and one of its biggest advantages is that it’s cost-effective and scalable. You can be a solo practitioner spending, uh, $1,000 a month a- and be successful or a, you know, large group practice with dozens of locations spending tens of thousands of dollars. The internet, you know, they’re … provides you … you know, there’s low barriers to entry. There’s low costs to getting things started, and once you’ve gotten started, as you are more successful, you can easily invest more money into it. Garrett Smith: 11:55 Those three things, right? It’s pull versus push, it’s cost-effective and scalable, and then finally, you know, the thing that I like the most is that it’s easy to track and I can, you know, show practice owners and practice managers, uh, how their investment that they’re making is coming back in, in terms of new patient appointments, phone calls, you know, more traffic to their website, uh … whatever the, uh, metrics are that we’re, we’re, we’re really looking at. That stuff can’t be done with traditional offline marketing as easily or for the same price. Don Lee: 12:23 Yeah, and that, that reminds me of that, you know, famous old marketing saying where it’s … I know that half of my marketing dollars are wasted, I just don’t know which half. So that’s definitely, like, that rings to me right there. That that’s a, a big advantage that you can find out which half is working and you can do more of that and less of the other stuff. And that, that is definitely new. Garrett Smith: 12:41 Yeah, absolutely. And I think one of the reasons that many are scared to market at all is they really don’t know, right? Uh, marketing can often times be a little bit of a black box and until the internet and a lot of these other digital channels, uh, have provided the ability to kind of do some advance tracking, I can see how people would be afraid to just sort of put their money in a black box which oftentimes became a black hole. Garrett Smith: 13:05 But I think with internet marketing, the great part is that, you know, it’s no longer you versus your agency, you versus your consultancy, or you versus your in-house marketer trying to get success. It’s really you working together to improve those numbers. Once you know what’s not working, well now it’s time to get to work fixing that and trying to improve it or maybe, you know, that channel never will benefit but at least you know that. And I think having more definitive knowledge, and also … And with more knowledge comes more control. Once you get started with internet marketing, I think you find that, uh, it’s a little less, uh, mystifying than, uh, before you got started. Announcer: 13:43 Pro-tip number two: effective online practice marketing allows more patients to discover your practice in a cost-effective, trackable manner that can scale up as your practice grows. Don Lee: 13:57 All right, so now I’m convinced that marketing can be a good thing and that it’s not this icky kind of, “Hey look at me, look at me, look at me.” But an opportunity for me to further serve my patients and further serve my community, so okay. I’m, I’m buying in, I see how the internet has enabled that. Don Lee: 14:41 I’m just, I’m really, really busy. So even if I see this as a, as a good idea, how are you going to help me forward with it without just giving me another pile of work to do? Garrett Smith: 14:53 Absolutely, I, I think there’s really five steps to get yourself started with internet marketing and, and these five steps are often overlooked and are a big reason that many people, the first time they decide to start marketing their practice online, end up failing. Garrett Smith: 15:08 So first and foremost, I think getting started requires you to get all the key stakeholders inside of your practice and really think about, you know, who are your goals? And, uh, what are your goals? A lot of times people want to jump right into strategy or tactics, make an ad buy, but, but at the end of the day if you don’t start with a, a strong goal in mind, your marketing’s never going to, uh, succeed because you won’t have anything to measure it against. Garrett Smith: 15:33 Uh, so the second step, I think, once you’ve understood what your goal is, is to really determine who you want your target patient population to be. A lot of practices today are working with patient populations that they might not particularly want to be working with. They might not be as profitable as other ones or the cases may not be desirable. And so, you know, before you get started with internet marketing, you should really take a deep dive and, and figure out who do you wanna serve and then from there, you know, you can start to talk about the strategy and, and tactics to, to acquire those patients. Garrett Smith: 16:06 Once you’ve got a strong idea there at a high level, right? The, the next step is really to pick a point person in your organization. I- i- if you’re swamped with all other aspects, you may need to pick somebody who isn’t traditionally seen as a marketer. There maybe somebody inside the practice who is really passionate about the internet or, or knows their way around really well. It doesn’t have to be you as the practice owner. It doesn’t necessarily have to be a physician or the practice manager. It could be somebody in the office staff that really enjoys it. Or if the budget provides, you can work with folks like myself who can kind of help guide you down that path, uh, and keep you on the right track as, as you progress. Garrett Smith: 16:41 The fourth step really, once you’ve figured out, you know, goals, who you want your target patients to be, and, and you’ve picked your point person to kind of own the plan and execution, you’re really wanna go out there and audit your existing online presence and patient experience. Garrett Smith: 16:54 You can think of this a- at a very high level as your own little, uh, strength, weaknesses, opportunities, and threats exercise. A, a SWAT for those of you have got an MBA or spent any time in marketing classes over the years. It’s really good to put yourself in your patient’s shoes and go through the whole process. You know, google your name. Google your practice. Click on the links. Go to your website. Look for information. Fill out a form. Even change your n- voice a little bit and call into your practice and see, you know, what’s the experience like when someone picks up the phone a- a- a- and presents your practice, uh, to the outside world. You can also do this with your competitors in your local areas or even competitors in, in other states. Uh. It’s always great to get ideas and you can kind of compare and contrast and see where you’re winning and, and perhaps where you’re losing in, in relation to, to others. Garrett Smith: 17:41 Armed with all this information, I think, only then in step five can you really kind of sit down and create a plan that turns these goals and, and strategies into action. Without having a plan, you should plan to fail. The plan doesn’t have to be overly complex. It doesn’t have to be a long-term plan. But you do need to have a plan that’s rooted in reality and is something that you could show somebody and, and articulate, uh, how you think you can achieve those goals. Don Lee: 18:07 Yeah, and I’d like to expand on number two there just for a second because I think that’s so huge and, again, one of the things that’s often overlooked in, in marketing that I’ve, I’ve learned along my way is: marketing is an avenue for you to basically, in a sense, choose your patients or choose your customers, right? Don Lee: 18:28 And if you think about it, think about it from the, the way you practice. There is probably a particular service that maybe you have extra capacity for that you need to fill or one that you’re particularly good at. You particularly enjoy doing it. Maybe it’s one that makes you feel really good because you know there’s a big need out there for it that’s not being filled. Like, this actually gives you an opportunity to target those very specific things and to choose the people you want serve, basically, and, like, really kind of do medicine on your terms instead of, like I said, you know, having the Feds tell me what to do, have the health plans too on top of everything else. Like, this in a sense it starts giving you back some of that control so you can pick and choose where you want to work. I think that’s huge. Garrett Smith: 19:09 Absolutely. Marketing your practice doesn’t have to be about absolute success. It doesn’t necessarily have to be about outrageous growth in the number of patients you’re serving. Participating in internet marketing could literally be just about better serving your existing patient base, maintaining a relationship with them months in between, you know, their visits or years in between their visits. Garrett Smith: 19:31 I think a lot of times folks get caught up in the idea of becoming Coke or Pepsi. That’s not the point with practice marketing and online marketing. I think there’s levels to it. And so, relatively speaking you can be very, very successful with your online marketing without, uh, coming across as, uh, a self-promoter or having to necessarily be a celebrity doctor. There is a way for you to simply look at this, as Don has said, as a service you’re providing, as an educational service to the general public, and as a way to prevent, uh, perhaps patients, uh, from going to other places where they’re gonna get inferior care. Announcer: 20:16 Pro-tip number three: if you’re ready to get started with marketing your practice online, it’s important to establish goals, appoint person who will own the effort, then create a focus plan that will guide your successful execution. Don Lee: 20:32 All right Garrett, so on the way out here, why don’t we tell the audience what they can expect from the podcast going forward? Garrett Smith: 20:37 So in each of the upcoming episodes, Don, we’re going walk the listener through the steps required to be successful with internet marketing all in short 15 to 20 minute episodes. Speaking of next episodes, be on the lookout for episode two: Understanding your Target Patients. Until next time. Announcer: 20:55 Thanks everyone for listening to this episode of The Practice Marketing Podcast with Garrett Smith and Don Lee. If you enjoyed today’s episode please leave a review and subscribe and for more great content and to stay up to date visit Inboundmd.com/podcast. We’ll catch you next time. Garrett Smith: 21:13 Hey everyone, Garret here. For more information about getting started with internet marketing, check out chapter one in Book Now! Internet Marketing for Healthcare Practices. Available at Healthcaremarketingbook.com.